Chapter Four is now up at Carousel Tides, for your reading pleasure. Note that the link goes to the front page, to avoid inadvertant spoilage. Steve and I solicited the help of our local independent bookseller, Ellen Richmond, owner-operator of the Children’s Book Cellar in Waterville, Maine, to draw the names of the thirty-six winners of the ebook edition of The Dragon Variation, containing Liaden Universe® novels Local Custom, Scout’s Progress, and Conflict of Honors. The fruit of her labor is: Lissa Davies! Thanks to everyone who took the time to enter the contest, and to all the news sites, bloggers, individual readers, and friends of the Liaden Universe® who helped to boost the signal! Special thanks to Baen Books publisher Toni Weisskopf, Heather Massey at The Galaxy Express, long-time Friend of Liad Mike Barker, Ellen Richmond, Amy Cryway, and Bill Taylor! This was fun! Let’s do it again sometime! July 19, 2010, edited to Add: Individual emails were sent to all winners at the email address they provided on their entry. If you have not received that email, or if the email address you provided in your entry is one that you don’t ever check, please write to me at sharonleeATkorvalDOTcom (where The Usual replace AT and DOT) to claim your prize. Thanks. 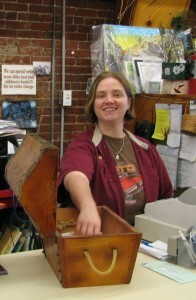 Posted on July 17, 2010 July 19, 2010 Author SharonCategories Blog8 Comments on And the winners are. . . The Expanding Universe contest is now closed to entries — and the waiting begins! 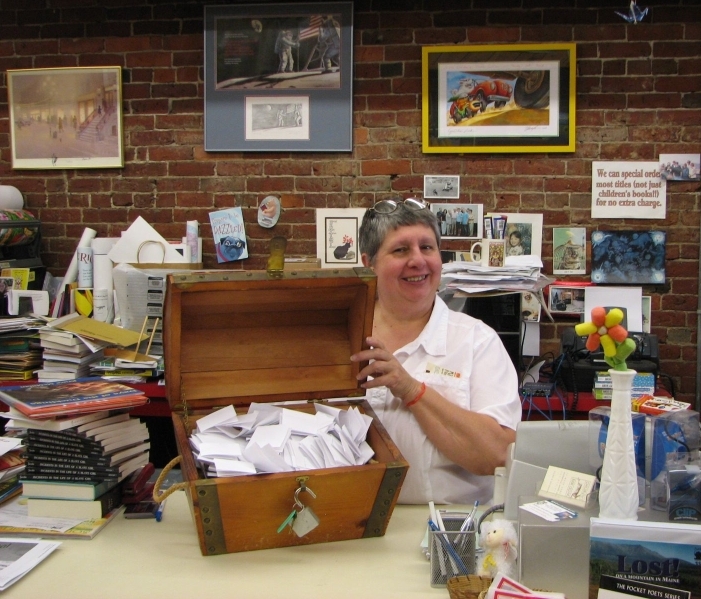 Later today, Steve and I will take the Big Treasure Chest full of contestants down to Deepest Waterville Maine, where Ellen Richmond, the proprietor of our local indie bookstore, Children’s Book Cellar will exhaust herself by pulling 36 separate entries. Watch this space for the winners list. In the meantime, we’d like to thank Toni Weisskopf of Baen Books for making this contest possible; Mike Barker for suggesting it; Heather Massey of The Galaxy Express for showing us how it could be done; all the bloggers, news sites, individual readers, and friends of the Liaden Universe® who boosted the signal and every single one of the more than three hundred folks who entered the contest. May the luck be with you all! So, I haven’t been around the blogs much, a trend that will probably continue,what with one thing and a lagging book. Still behind on the email. I love y’all, though. Steve has been doing the work of four good men; meaning there are many autographed Saltations in the sky, on the road, and, reportedly, in the hands of the folks who supported the writing of the project. Signing the books reminded us of how much we owe you guys, and we thank you again, deeply. I still do worry about the folks on the Lost List. Take a second to look at the list, especially if you’re in the US and haven’t received your book. If you see your name, please don’t assume that I’ll cross-check you against the SRM database and thus discover your whereabouts. Be proactive! If you see a friend’s name on the list, give ’em a nudge, why not? My goal is to get a book into the hands of everyone who was kind enough to subscribe. The last week included an emergency run for Argent the Forester to the Subaru Repair Shop, where he emerged willing, and now able, to drive Steve to NASFiC in a couple weeks. The day-job continues to be Entirely Too Stressful. I blame the heat. And administrative boneheadedness. This evening, Steve and I are scheduled to read, and he, as a Trustee, to act as host, at the Winslow Public Library’s 100th Year Anniversary Party, which will be lots of fun. The Expanding Universe contest has 326 entries so far. Have you entered? Have you blogged? Have you pointed a friend to the contest? Time’s running out for all of those things; the contest deadline is midnight EDT today, Friday, July 16. Today, late as it starts will be an on-the-sofa-with-the Leewit-day. Hope everyone has a stress-free Friday! Remember! The Liaden Universe® celebratory Expanding Universe Contest for a chance to win one of thirty-six electronic copies of The Dragon Variation by Sharon Lee and Steve Miller, or (if you’re a blogger who has boosted the signal and posted here) to be entered into a drawing for a BN gift card is in its last hours. The contest goes over at midnight, Eastern Daylight Time (4:00 GMT) today, Friday, July 16. Mozart takes a well-deserved break at the word factory. August 2, 2011: It having been more than a year since Steve and I finished shipping subscriber copies of Saltation to all the subscribers we could find, we have now closed the shipping window. If you find your name on an old webpage out there on the intertubes somewhere, please don’t write to me asking for your book. We never intended to keep shipping books until the heat death of the universe, and really — a year is plenty of time to notice that the book hadn’t arrived and to contact us. The subscriber books have arrived at SRM Galactic Headquarters. As of this writing, many hundreds have been signed, sealed and mailed. Within the US, the books are traveling by media mail, which means a three-to-14 day delay before they reach their final destination. Outside of the US, travel is on the knees of the gods. Please don’t write to ask if your book has been shipped, but trust that the system is working as it should. That said, we do have a list of people who did not reply to the email asking that they verify their shipping address. If you see your name or the name of a friend or loved one on the list below, please do write to saltationATkorvalDOTcom (where AT and DOT are replaced by The Usual) with your shipping address. 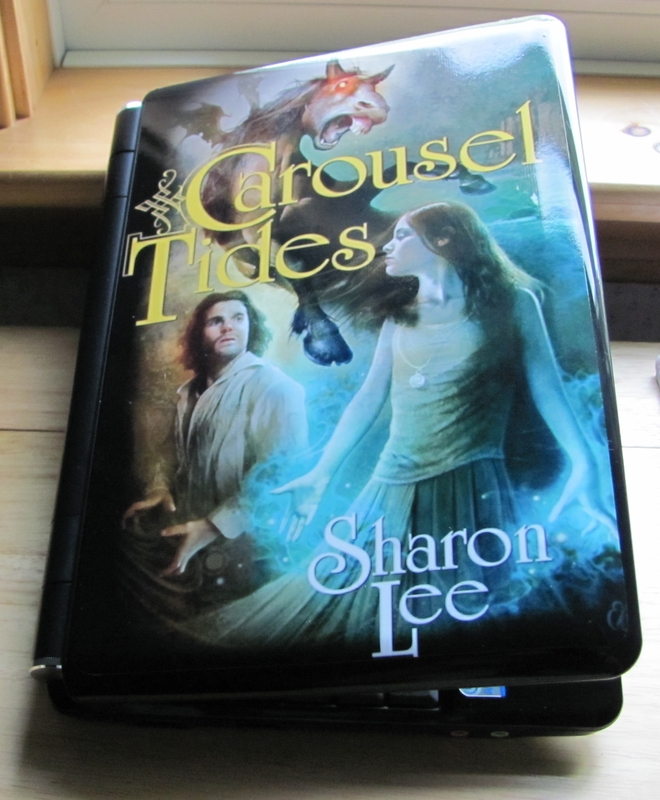 In celebration of the publication of Mouse and Dragon, the thirteenth novel set in their Liaden Universe®, authors Sharon Lee and Steve Miller are holding an Expanding Universe Contest! No less than thirty-six electronic copies of The Dragon Variation will be given away. The contest is open to anyone who has NEVER read a Liaden Universe(R) novel. This is the perfect chance to addict introduce friends to the wonders of Liad! Complete rules are here. Please note the additional drawing for bloggers who help spread the word. Contest ends Friday, July 16 at midnight EDT. Both Fledgling and Saltation have had turns on bestseller lists over the last couple months. Saltation was Number Four on the Wall Street Journal’s bestselling science fiction for the the week of April 25 and was Number Ten on the Locus list for April (reported in July). Thank you all — we couldn’t have done it without you! 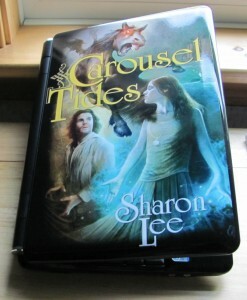 There are three full chapters, as well as ancillary information about the novel and the world of Carousel Tides, Sharon Lee’s contemporary Maine fantasy, now up. Keep checking back, there’s more to come! Steve will be attending ReConStruction, the 10th Occasional North American Science Fiction Convention (NASFiC), in Raleigh, NC, from August 5-8. Yes, You Can Read Lee and Miller on Your Ebook Reader! Kindle, iPhone, iTouch, Sony EReader, and other devices. All of the above folks do mail order and take want lists. This InfoDump is a product of the Liaden Universe®, accept no imitations. You have received this message because you asked for it. If you wish to subscribe to the Liaden Universe® email list, go here. 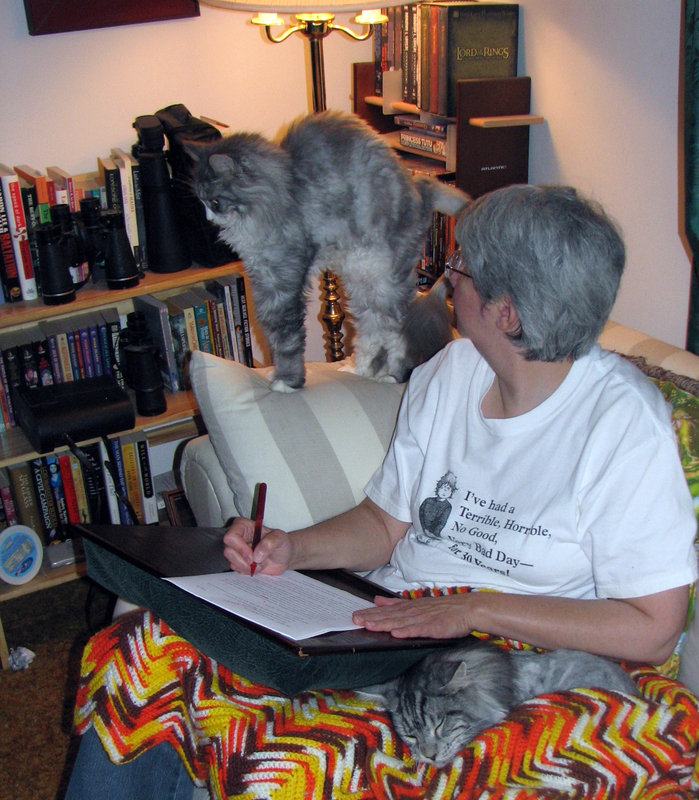 In celebration of the publication of Mouse and Dragon, the thirteenth novel set in their Liaden Universe®, authors Sharon Lee and Steve Miller are holding an Expanding Universe Contest! Yes! No less than thirty-six electronic copies of The Dragon Variation will be given away. *The Expanding Universe Contest is open to anyone — and everyone! — who has never, ever, cross-your-heart-&c read a Liaden Universe® novel. *Reply to this blog entry with your name, and where you heard about the contest. From those who respond, 36 lucky winners will be chosen by drawing. If 36 or less people enter the contest, then everyone’s a winner! *Each winner will be asked to provide their email address for purposes of receiving the code that will allow them to download their prize. *A list of winners — with links to their websites, should they wish, and links to the website where they heard about the contest — will be published in this blog. Small Print: The contest begins RIGHT NOW and will end at midnight Eastern Daylight Time (4:00 a.m. GMT) Friday, July 16. A list of winners will be posted on this blog on Saturday, July 17. It is the responsibility of the winners to contact Sharon Lee according to the instructions given with the winner’s list. Prizes will be held for 12 days. It’s that simple. So! Those friends you wanted to get hooked on the Liaden Universe®? Point ‘em this way. Been meaning to try this Liaden thing, but never got around to it? We’re making it as easy for you as we can. If you’d like to share the news about the Expanding Universe Contest, there’s a little something in it for you, too. Hit “reply” and post a link to your blog entry mentioning the contest, and be entered in a drawing for a $36 gift card from Barnes and Noble. Yes, you may also enter the drawing for a copy of The Dragon Variation, as long as you meet the contest criterion. Steve and I spent all day, from early to late Saturday and from early until now Sunday signing, packing and labeling subscriber copies of Saltation. I can report with confidence at this moment that hundreds and hundreds of books will go into the mail on Tuesday. That only leaves hundreds and hundreds left to process, but, hey, progress — and a huge shout-out and Thank you! to Amy Cryway, who packed books like a mad, packing thing. …which looks Much Classier in person than it does in the photo. Man, that is a cool cover! Also! Watch this space for Teh Shiney, promised earlier in the week, and brought to you with the connivance and assistance of long-time Friend of Liad Mike Barker, Heather Massey of The Galaxy Express, and Toni Weisskiopf of Baen Books. Details follow this evening. This has been your Distant Early Warning. And now, Steve is making burgers, and there’s a class of sangria with my name on it by a comfy chair under a tree. For those who celebrate the Fourth of July, have a comfortable and safe holiday! For those who don’t celebrate, well — you be safe and comfortable, too; that’s not just for holidays you know. Remember! You can (and, dare I say, should?) read Liaden Universe® novels and stories, as well as other works by Sharon Lee and Steve Miller, and by Sharon Lee on your ereader. These electric books are available directly from Baen Webscriptions. Yes, you can read Webscriptions ebooks on your Kindle, and on your Ipad. Saltation subscribers, take note! There is a list of people who are in danger of not receiving their books here. Please take a moment to check this list for your name, or the name of a friend or loved one. If your name does appear on the list, instructions for mending that problem are at the top of the entry. Steve and I are still signing books. Once again — this is a lengthy process. Please don’t write to me and ask if your book has been mailed — at this point, the answer is “no.” Also, I don’t know when your book will be mailed. If you wrote to Mr. Raun to ask if your name was in the database and received a negative answer from him, writing to me will not produce a positive answer. We are using the same database.